Record Progress in a Practice Log Book. Buy a little book for their practice log so they can see their progress and feel proud of themselves as they progress. Research shows that writing down a goal increases the chances of it actually happening by 400%. Creative Rewards for Practice. In an interview by Anastasia Tsioulcas with NPR, Charlotte Kufchak, mother of the now 20 year old violinist Rachel Kufchak, said she created colourful rewards to keep her kids engaged with practice. "We bought dried beans and some sparkly paint and had a lot of fun making the beans as colorful and pretty as possible," Kufchak says. "Then we paid the kids in beans for practicing. It was great — we never ran out of 'cash.' Each quarter hour of practicing was worth a certain number of beans, and each child could save, exchange or spend their beans as they liked. We had a list of prizes like special treats, Legos, a $5 deposit in their bank account or a symphony concert. The beauty of it is that it can be tailored to each child's needs and each family's budget and priorities. And the kids were willing to practice!" Gamify Practice Sessions. Another strategy used by parents of some talented musicians is a game called “three penny practice.” You put three coins (or coloured beads) on the left hand side of your music stand. If you play it correctly once, you move one coin to the right hand side. If you play it again and miss a note, you move all won coins to the left and start again. The goal is to move all three coins to the right hand side with three perfect repetitions of the practice piece. Change Practice Sessions Timing. Some parents report a marked improvement if they move practice sessions away from the evening, to a before school morning experience. Kids are more alert, less distracted and often get better results! 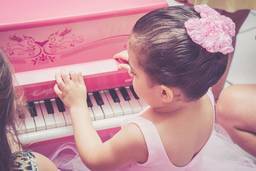 A lifetime of joy is available to children who become accomplished musicians, but first they must master their craft. Supporting them to have the self-discipline to maintain a daily practice routine is one of the greatest gifts you can give a musical child.